Em's Craftwork and Quilting at Mount Colah: Absolutely Definitely My Favourite Apron !! Everyone in my household loves Charlie and Lola. We went to 'Charlie and Lola's Best Bestest Play' at the Sydney Opera House in the middle of last month (January 2011). After the show finished, we collected some 'Charlie and Lola's butterflies' from the floor of the Play House to come home with us for scrapbooking. I took the opportunity to make a template of the butterfly. I then appliqued different colours of the shape on my black apron that I have made from the thick material, mixed between hem and linen, left over from when I was re-covering our dining chairs at home. I wear the apron when I'm in my sewing room. It helps to keep loose threads and sharp pins from catching onto my clothes and, subsequently, scattering around my home, everywhere I go. 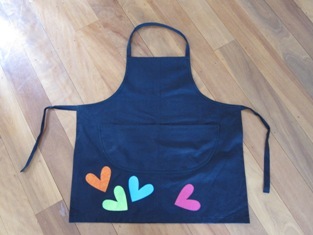 It is acutally absolutely definitely my favourite apron - I'm starting to sound like Lola.....! !